It has been a number of years since I last taught a summer school class -- California's recent budget woes have been tough on community colleges -- so when I was told that I would have the chance to teach Art Appreciation this summer a surge of inspiration hit. Thinking over the opportunity I asked myself a question: "What can be done to make this summer's course especially interesting and memorable?" The answer came to me rather quickly: bringing guest speakers to my class seemed like a great way to make the class fresh and vital. Since there is no budget available for speakers, I decided to try bringing visitors into my classroom via Skype video calls. Initially the plan was try Skype on a limited basis and see how things worked out: four or five guest speakers would be plenty. At the heart of my experimental class there would still be the backbone of a conventional class: students would read an assigned text, take quizzes and hear me lecture on relevant topics. I posted a notice on my Facebook timeline asking for volunteers, mentioning that I was not able to offer compensation for speakers. Since I have been blogging about art and artists for four years, I knew that I had many artist Facebook friends to draw from. Within a week's time I had enough volunteers to schedule 17 guest speakers and also a list of alternates, many of whom have let me know that they will be happy to speak the next time that speakers are needed. I was amazed and pleased at the response. 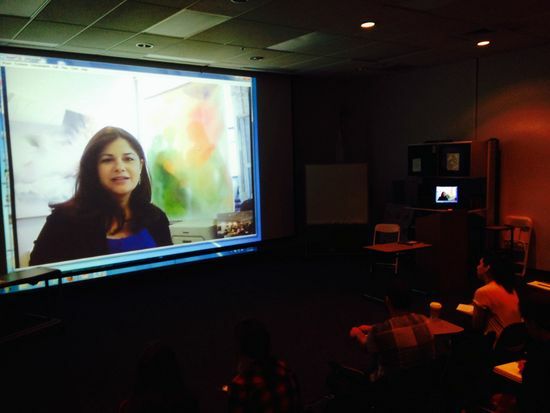 If you are a teacher, you should keep in mind that if speaking simply involves connecting with a class for 30 minutes via Skype there may be many people in your field willing to volunteer their time and expertise. With my calendar filled up there was a practical concern to address: how would I ready the classroom for Skype visits? The room where I teach art history is a "smart classroom," which means that it features an overhead LCD projector connected to a computer which is in turn connected to high speed internet. As it turns out, all I needed to do was add a webcam and microphone to the computer so that my guests would be able to see the classroom and take questions from my students. 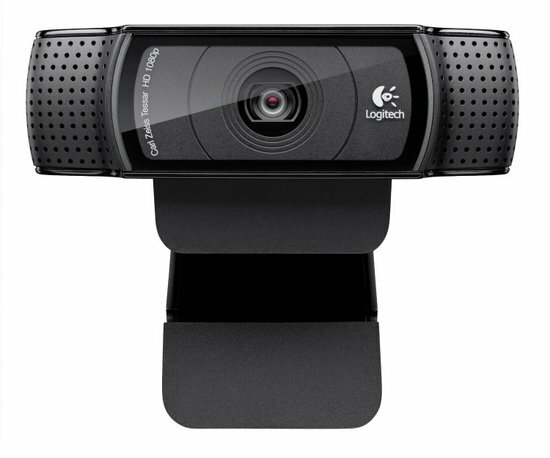 I chose a Logitech HD Pro Webcam, which sells for $60.67 on Amazon.com and it worked very well. We had virtually no technical problems with Skype although there were some minor issues with video quality from time to time when our guests had intermittent internet service. One of the beauties of having Skype guests is that no travel is involved. That is a good thing as our first guest was Conor Walton, who spoke to us from his studio in Ireland. Conor came through to us flawlessly -- the sound and picture were both terrific -- and I took a few photos of the screen as he spoke and also recorded a short video clip with my iPhone. This became my habit and over time I created an archive of short videos that captured bits of what each speaker showed us and had to say. As other Skype guests followed a bit of a routine developed. I had each artist speak about his or her background for maybe 15 minutes, and then we switched gears and talked about their art. A wonderful feature of Skype is that if you open a webpage with Skype video on a window appears at the top of the screen where whoever you are talking continues to appear. Using this feature, artists were able to talk about their work while hovering above images presented on their websites. 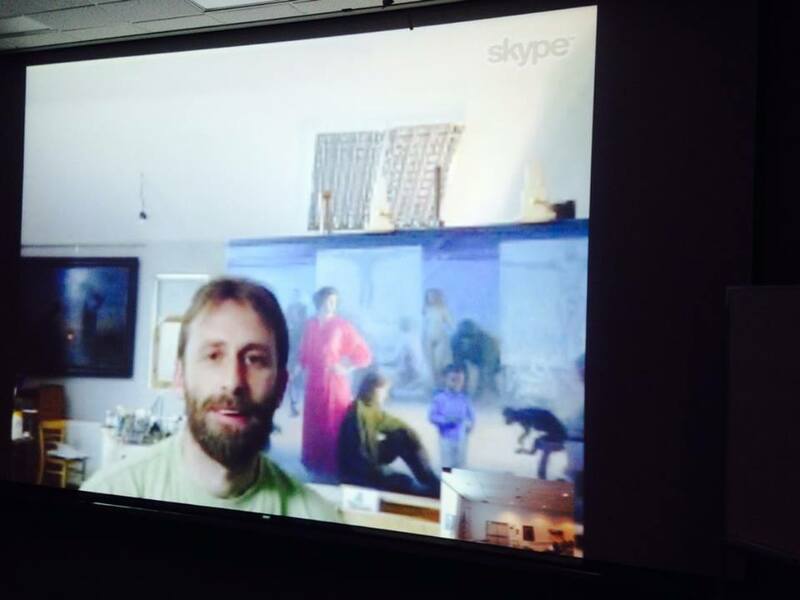 The video below shows artist Thomas Wharton discussing one of his portraits in this mode. Artist Thomas Wharton discusses a portrait presented on his website. 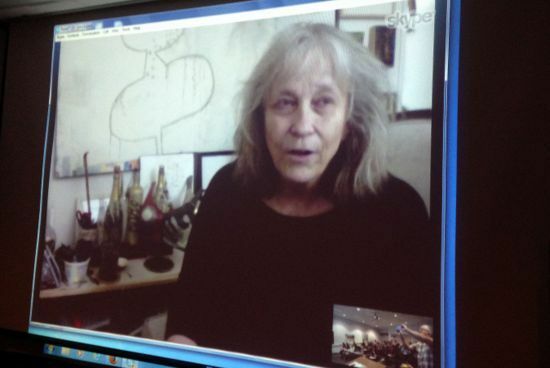 "One thing that I have found in common with all the artists that we have met through Skype is that each one has taken risks. They have fallen and gotten back up, not just in art but also in life." Our guest speakers also talked about some of the range of media they had explored and about their other roles and professions. For example, Karen Azarnia spoke about being a gallery director and curator, Serena Potter talked about creating performance art and Lori Escalera described her success as a chalk artist creating works in public. "Inside you, you know what is right for you." I must say it has stayed on my mind even until right now. It was said by a recent guest speaker: Thomas Wharton. It made me think of recent and future decision I have to make which I have been thinking about constantly, but when Thomas Wharton said that it was as if somebody shook me and said "wake up!" *** Sam Nejati said: "I look at painting as a human body or a symphony; every piece has to function. It is like me and the canvas have a conversation." I liked the way he expressed his views on what art and being an artist means for him. *** My favorite artist so far has been Jean Paul Mallozzi. When we Skyped him, he said that he "purposely makes himself uncomfortable to be great." I am a musician and music teacher so I understand the importance of challenging yourself artistically. *** The best thing that any of our guest speakers has said came from Nathan Lewis: "Art is a way to figure out who you are: it's not a competition." Almost all of the artists spoke to us directly from their studios so that we are able to view works in progress and get a feeling for the environments they surrounded themselves with. 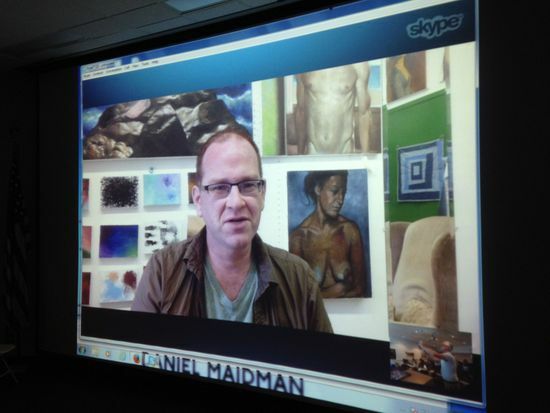 Daniel Maidman Skyped us from New York and talked about how he works with live models. Karrie Ross showed us how she works in her Los Angeles home and makes it double as a studio. 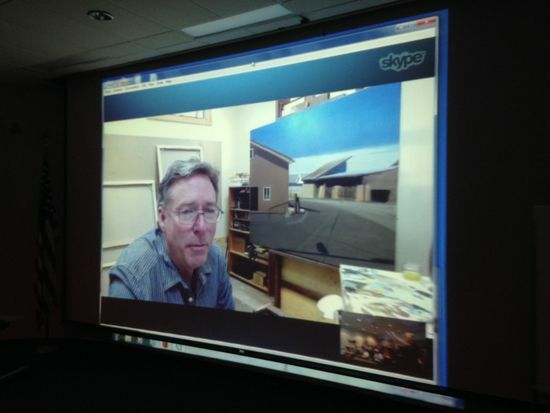 Christopher Benson Skyped us from New Mexico and gave us glimpses of the superb studio that adjoins his home. I can't say enough about how powerful the presence of this remarkable slate of guests turned out to be. They made the idea of art come alive and I think the class is going to be a game-changer for many of my students and for me as well. As our final guest -- Lawrence Gipe -- said to me during his talk "We may have converted a few people into artists today." He may be right, but for the many students who took my class who will be going to other fields there is no doubt that they will have been inspired by the passion and intelligence of our guest speakers. I am personally grateful to each speaker, and I know that my students are too.